The critical approach to L2 writing is arguably one of the most significant recent developments in L2 writing pedagogy. A. Suresh Canagarajah provides a thorough discussion of this topic in "Critical Academic Writing and Multilingua"l "Students." This volume facilitates teacher self-reflection and enables readers to better understand the motivations and pedagogical implications--especially for L2 writing--of a more openly pedagogical approach. "Critical Academic Writing and Multilingual Students" explains what it means to commit to an academic pedagogy, in terms of form, self, content, and community--and what it can accomplish in the L2 writing classroom. It's a guide for writing teachers who wish to embark on a journey toward increased critical awareness of the role they play, or potentially could play, in the lives of their students. Description: Illustrations 296 The critical approach to L2 writing is arguably one of the most significant recent developments in L2 writing pedagogy. 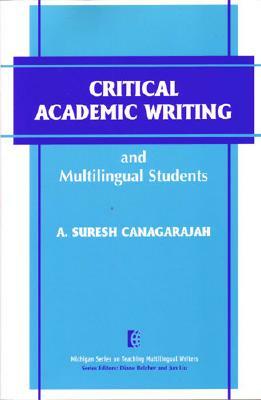 A. Suresh Canagarajah provides a thorough discussion of this topic in "Critical Academic Writing and Multilingua"l "Students."